The 11 Steps to Start your Small Business! Starting a small business can seem overwhelming at first, but if you are reading this article, chances are you are brave enough to consider it or already have. Since small business make up 99.7 percent of the U.S. economy, according to the U.S. Small Business Administration, it seems like you aren’t the first and won’t be the last. But, if you have that entrepreneurial hunger, what you probably want to be is the best. Whether you want to start a business with five employees or 300, the fundamental and basic steps are essentially the same. The SBA lays out the 10 steps to starting a business that might just be the beginning of a beautiful relationship between you and your dream. Whether you’re starting a flower shop or an auto body repair shop, having the right insurance for your business and following these simple and fundamental steps is bound to set you up for success. Business Auto – Does Your Current Insurance Cover Your Hobby-Now-Turned-Business? Once you find the perfect combination of doing what you love and making money, what else could you worry about? You have turned your hobby into a money-making business, and now life is good. What could go wrong? It is important to remember that starting a new business is a whole new venture when it comes to the rules of insurance. If you have not had previous experience with running a business, it may come as a surprise that if you are using a vehicle for business, you may be required to hold a separate auto insurance policy. 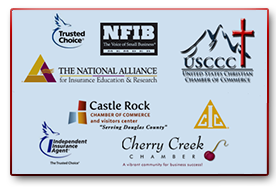 The insurance professionals at Insurance Town and Country can help you navigate your way through these different policies as you begin to understand the unique needs of your business. As a general rule of thumb, vehicles that are larger have the potential to cause more damage. It is important to remember this when you are using your vehicles to clear snow or deliver baked goods. Better understanding your business’ needs will allow the folks at Insurance Town and Country to answer your questions as you chose a package that is best for you. Having the right commercial auto insurance policy will keep your services running as they should and provide some peace of mind. Call Insurance Town & Country today and speak with one of our insurance professionals. We have offices in Denver (303-388-7216) and Castle Rock (303-688-1251). Call us today to schedule your consultation, and let us help you better understand your business! The agents at Insurance Town and Country are more than just insurance policy experts. We offer a range of products and services to small businesses, including bonds. Our clients have a multitude of small business bond choices to fit their needs and goals. We also understand that choosing a bond that makes sense for your unique circumstance may be challenging. Our Bond Specialists are trained to help walk business owners through their options and choose a bond that makes sense for their business. If you are in need of any of the following bond solution services, contact us today at 303-388-7216 or Request a Free Quote Online. Let Insurance Town and Country take the wheel and guide your company through the storm. Give us a call at 303-388-7216 or request a free quote online, today! What is a BOP Insurance Policy? Call us today at 303-388-7216 to learn more about BOP Policies and have one of our Professional Insurance Specialists customize a policy for your business or request a free quote online!